We’ve moved! With a whole website dedicated to switch plates and electrical devices, your shopping just got easier. Find the same great quality products in an online store with a fresh new look at Kyle Switch Plates. Find us at www.kyleswitchplates.com and bookmark our site for your next home improvement project that results in the need for brand new narrow, oversized, combination and regular, standard switch plates and coordinating switches and outlets. Everything you need, all in one place. As a female, I know a lot about Real Housewives, shallac manicures, and how to route every errand trip so that I “just happen” to pass a Starbucks. I also happen to know how many calories are in the Mocha Cookie Crumble – and that it’s worth it. What I do not know a lot about is switch plates. You know – those plastic thingies that surround every light switch and outlet in your home. You really don’t even notice they’re there until you repaint your home and have to A) remove them and B) discover they stand out wayyy more when the wall is not painted white. I guess I shouldn’t say I “don’t” know a lot about them – the truth is I “didn’t” know a lot about them. But I do now, and it turns out they’re not as complex (read: intimidating) as I thought! So if you don’t know the difference between a “toggle” and a “rocker” you’re in the right place. The most common switches are “toggles” and “rockers” (sometimes called “Decora Rocker”) and it’s super easy to tell the difference. Toggles have a small protruding switch that you flip up and down and Rockers are larger, flatter rectangular switches that you rock up or down to turn a light on or off. Toggle switch plates have a small rectangular opening and go with toggle switches, and decora plates have a larger rectangular opening and go with decora rocker switches. • NOTE: How many switches are controlling a light? When replacing a switch, think about how many other switches control the same light (or ceiling fan). If this one switch is the only switch for a particular light, you’ll need a standard switch (known as a singe-pole switch). But a single-pole switch will not work in a situation where you have two separate switches (perhaps at opposite ends of a hallway) that control the same light. In that case, you’ll need a 3-way switch. In other cases, where you have 3 separate switches controlling a single light, you’ll need a 4-way switch. There are a few main differences between outlets: shape, capacity (15 amp vs 20 amp), GFCI (for outlets near water such as in a kitchen or bathroom) and tamper resistant (for child safety). • Don’t mistake the shape of your outlet. Before replacing an outlet cover plate – also called a plug or duplex receptacle – pay special attention to whether you have a plate with 2 separate oval openings or a rectangular decora plate. The decora plate is exactly the same as the switchplate for the decora rocker switch (shown above). “Amps” refers to the volume of current and your outlet will either be 15A or 20A. 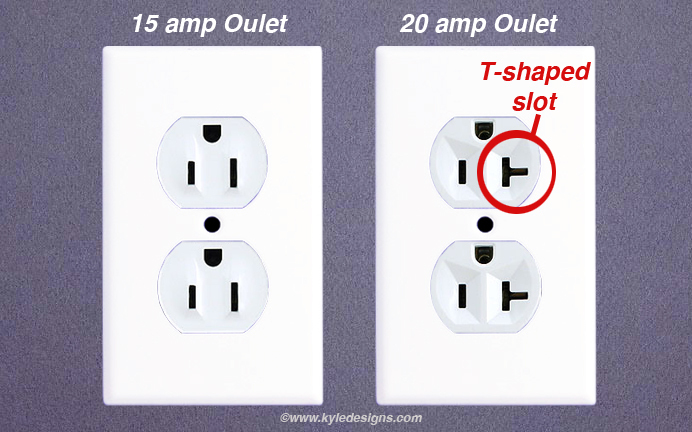 Just look at your outlet to tell the difference – 15A outlets have 2 straight slots and 20A outlets have 1 straight and 1 “T” shaped slot. • SAFETY FEATURES: Is your outlet required by law to be GFCI? If replacing the outlet itself, note whether it’s currently a GFCI (“Ground Fault Circuit Interrupter” – sometimes called GFI for “Ground Fault Interrupter”) receptacle or whether it needs to be one. These plugs prevent electrocution by automatically cutting power to the outlet when it detects a variation in electrical current. Your kitchen, bathroom, wet bar, hot tub and swimming pool areas – anywhere near water – should have GFCI receptacles. They are required by the electric code and can prevent death if you accidentally drop an electrical appliance, such as a hair dryer, in water. 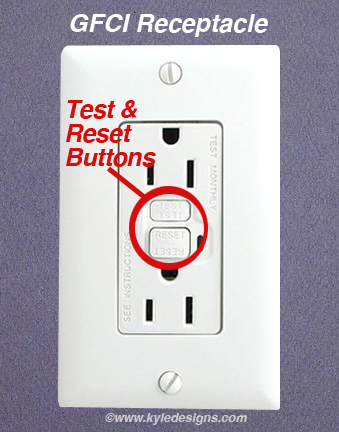 You can easily identify GFCI receptacles because they always have 2 buttons (labeled “reset” and “test”) between the plugs. 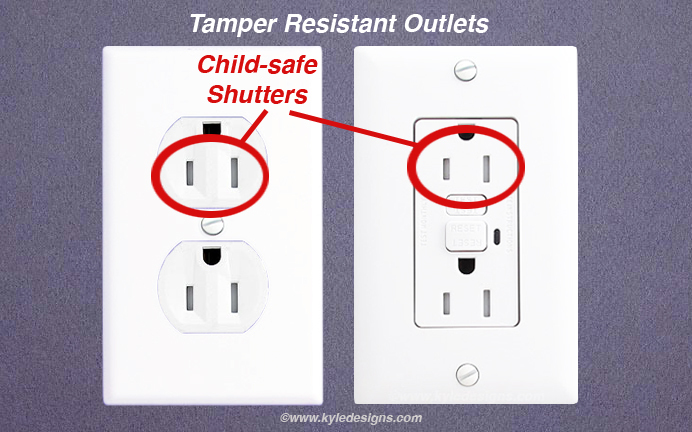 Another important safety feature for children is for your outlet to be tamper resistant. When the outlet is not in use (nothing is plugged in) there are little shutters inside that close off the openings. This prevents children from getting shocked when they try to stick something into the outlet, since the shutters block access. The spring-loaded shutters only open when a plug is inserted and both springs are compressed at the same time. The width of the plate is know as “gang.” A single-gang plate will hold 1 switch or outlet, a wider double-gang plate will hold 2 switches or outlets, a triple or 3-gang plate will be wide enough to hold 3 and so on. The width and height of the plate can vary from a standard plate if the plate is narrow, mid-size or oversized. If you need a plate with more than 1 type of device, you need a “combination plate.” An example of a combination plate is a 3-gang plate with 2 toggles and a duplex outlet. Something to keep in mind is that switch plates can be rotated 180 degrees. If you find a plate that’s “almost” what you need but appears to be the opposite, just flip it over to fit your situation. Whatever type of plate you need and whatever finish you’re looking for, your best source for regular and specialty plates is Kyle Switch Plates – shop now at www.kyleswitchplates.com.